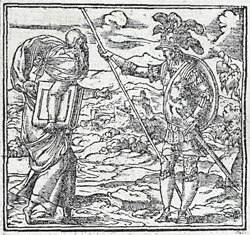 Alciato at Glasgow: Emblem: Unum nihil, duos plurimùm posse. Section: CONCORDIA (Concord). View all emblems in this section. One can do nothing, two can do much. Hac cera expressit Zenalis apta manus. Nec tamen alterius non eget alter ope. Cùm duo coniuncti veniunt, victoria certa est. Solùm mens hominem, dextrave destituit. The son of Laertes together with him that Tydeus begot, the skilful hand of Zenas expressed in this moulded form. One of them is superior in strength, the powers of the other lie in sharpness of mind, yet neither of them can do without the other’s aid. When the two come united, victory is assured. Mind or strength in isolation has often left man in the lurch. 2. ‘the hand of Zenas’. Two unidentified busts signed by Zenas are in the Capitoline Museum in Rome. Two sculptors of the second, or third century AD, possibly father and son, are known by this name. 3. ‘Mind or strength in isolation has often left man in the lurch’. Cf. Horace, Odes 3.4.65: force without counsel is destroyed by its own might.